”My visit far exceeded my expectations, I am looking forward to visiting Sri Lanka again”, said President,Chevron Lubricants, Danny Roden. Roden, was in Sri Lanka from September 9 - 10 together with Vice President Lubricants Asia Pacific region Farrukh Saeed, to review Chevron Sri Lanka’s operation and meet key stakeholders of the business. 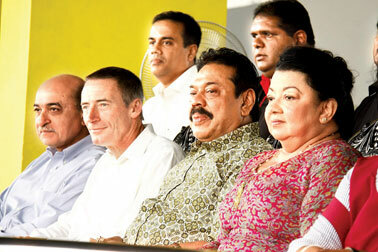 Danny Roden and Farrukh Saeed with President Mahinda Rajapaksa and First Lady Shiranthi Rajapaksa at the Caltex Rugby Match on Saturday at the Royal College Sports Complex. The tight schedule we put together for him to get the best out of the limited time available worked well to offer the global head the exposure on every aspect of the business and the opportunity to meet and interact with all key stakeholders. The first visit by the global head was a significant milestone for us which was only possible due to the peaceful operating environment prevailing in the country and consequent growth opportunities for investors, said, CEO of Chevron Lubricants Sri Lanka operation, Kishu Gomes. Roden said, “I heard what a wonderful country Sri Lanka is and was told what a great operation we had. My visit far exceeded my expectation. In two days, I met all our Chevron employees and many of our customers, and even had the privilege of meeting President Mahinda Rajapaksa and to interact with him for almost one and a half hours during the Caltex sponsored rugby match in Colombo on September 10. Chevron is committed to strengthening its business in Sri Lanka, and continuing our involvement in the ongoing development of the country. I look forward to visiting Sri Lanka again”. Saeed said: “I was very impressed with the trip to the South and our meetings with staff and customers. Our presence is very visible in the country and we have a solid distribution network with strong partners that reflect our long-term commitment to Sri Lanka. Sri Lanka’s contribution to the Asia Pacific Lubricants operation has been progressive. I’m also pleased with the returns we have been able to deliver to our shareholders locally. We are committed to more initiatives in Sri Lanka through new products and service offerings to meet the growing needs of the local market and the two fast growing export markets; Bangladesh and the Maldives coming under the direct purview of our Sri Lankan entity."